This is my bike in my back garden with nearly 2 feet of snow, so I imagine it'll be a bit deeper higher up the hills. When we'll get back up them thar hills is anybody's guess! I got out of bed before 4 am this morning and looked out the window to be confronted with a blizzard and 4 to 5 inches of snow already lying on the street outside. Knowing Baz tends to set off early I phoned him to cancel the mornings biking and to warn Bruce who was coming with us today as well. By 8am there was around 9 inches so the right decision was made and the rest of the forenoon was spent clearing snow from the street (see picture above). Ah well......I suppose we got a bit of exercise at least! 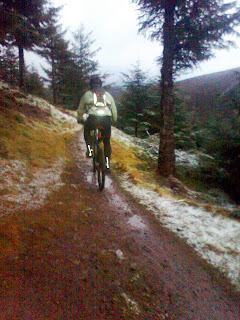 It was just as cold but not so much snow as last week, probably about half an inch at the top of the black route.In the improved weather conditions we completed the whole of the black route today with a climb back up to the top of the blue route to finish the ride. The mishap today was my chain jumping off going along a log with a resulting fall to the side accompanied by some rather agricultural language as I caught my leg between the bike and the log. No lasting damage apart from my pride! One of Clive's workmates out on a road ride 2 weeks ago was blinded by the low sun shining on the wet road and managed to ride into the back of a stationary Nissan X Trail. Now if you ever feel the need to ride into the back of a stationary vehicle, try not to pick a 4WD. They're just too big and flat at the back and against a bike there's only going to be one winner! Apart from wrecking the back door of said Nissan he also wrote off the bike and ended up waking up in an ambulance. Thankfully he suffered no serious injury, apart from his wallet, and I believe he's now considering taking out insurance to pay for any future accidents!! Snow 2 weeks earlier this year and new balls for Clive! Four inches of snow at the mast at the top of the black route at Glentress this morning, which is 2 weeks earlier than last year. Does this mean global warming is now global cooling, no doubt all those that profit from the global warming theory will dispute this, but it is a fact! Today was as cold and miserable as its ever been at Glentress and to add a bit of spice, Clive's chain came off as he negotiated a rooty section with a resulting heavy landing on his under carriage on the point of the saddle! After what seemed an eternity he regained his voice (and some composure) and was able to continue, albeit a bit gingerly! Baz and I managed to suppress our laughter until he appeared to have recovered a bit, but anyone finding anything resembling a bruised chestnut on the Pie Run please let us know! 17.5 miles today, it would have been further but we'd lost all feeling in our hands and feet by that point. Starting the descent from the mast at the top of the black route. The 6000 mile mark was passed on Tuesday night in what was a wet, muddy and cold ride. As a result of that ride and the wet cold feet I suffered on it, I purchased a pair of Enduro overshoes today, but you've nearly to be a contortionist to get them over your bike shoes and fastened up your ankles! I eventually managed though and quite a difference they made as the temperature tonight was in the minus's and my feet remained quite toasty! The next aim is to reach the 8000 mile mark on the bike's second birthday at the end of April 2011. That will depend a lot on the weather this winter! 19 miles to go to reach the 6000 mile mark since new. The since new is the bike , not me, by the way. I've had the Trek ex8 for 18 months now and hopefully in the next few days I'll manage to rack up the 6000 mile mark on it, the vast majority being off road. 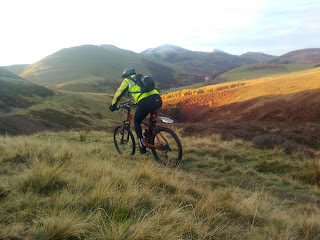 Today Baz was absent but Clive was out for the first time for a month or so and we did a shortish 17 miler up into the Pentlands. There was snow on the tops for the first time this year but we didn't venture that high up, it was cold enough where we were! I'm afraid I have to announce that the damage to Baz's forks has been terminal! However the good news! He's ordered a new set off the 'net and has convinced himself he's got a bargain. His old forks will be given a respectful send off....... i.e. they'll be chucked in the bin after we've torn them to bits to investigate their innards! Scotland's own mountain bike suspension service centre.....at last! 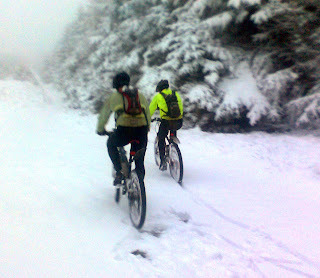 By the way, they're right into their mountain biking as well! I always laugh when I see this sign as it's at the top of a long slog, up in the Pentlands. It's actually to warn you about the descent at the other side of the gate, where we've reached speeds in the low 40mph's. The extra hour in bed on Sunday morning meant it lightened up a bit earlier than of late and it was a cracking morning into the bargain. No doubt that wont last! 29 miles this morning and the mishap.......my camera got damaged in a come off and Baz's forks appear to have given up the ghost!